In The History of Nottingham by John Blackner, printed in 1816, the author recalled the following event that took place twenty years before. I went with a friend, one morning in February to see what havoc stern winter had made in the coffee gardens at Lenton, which had been represented to me as a kind of paradise in the summer season; being unconscious, at that time, that one of the most wretched mansions of human misery stood within their precincts. Several robins were fluttering upon the keenly frozen snow, in quest of scattered crumbs; and a blackbird, all shivering with cold was hopping from spray to spray. The wind whistled, and bleak from the northeast, the angry blast blew. While walking in pensive admiration, my ears were stricken with the sound of a human voice, the tremulous cadence of which bespoke the anguish of the bosom whence it came. These were the words it uttered -'God bless you, master, pray relieve a poor prisoner, famishing for want of food, and trembling with cold'. A clap of thunder would not have made so deep an impression on the memory -death alone can remove the impression from the heart. Without calculating upon consequences, or reflecting that my strength was inadequate to the performance of what the wounded feelings of the heart suggested, I immediately set my shoulder to the door, with the hope of wresting it from its hateful hinges; but the unhappy man stopped me by saying, 'You will only, by a vain attempt, bring your self into trouble, and add much to mine; for if I should obtain the keeper's displeasure, he will not give me a morsel of bread to prolong my miserable existence, till the rule's of this court permit me to leave this abode of sorrow; in which case I must die of want here, and never see my disconsolate family more.' A flood of tears gave relief to the writer's half bursting heart, he forced the small contents of his pocket into the hands of the wretched sufferer, and then fled from this disgraceful dreg of the feudal law. What Mr. Blackner and his companion had stumbled upon was the Peverel Prison. Its occupant had come before the Steward of the Court of the Honour of Peverel or his deputy, and as he had been unable to clear his debts, had found himself confined in the prison. This court was a relic from feudal times and was to remain in existence until the middle of the nineteenth century. pub. Courtesy of the Local Studies Library. The 'Honour', a form of manorial lordship, had supposedly been created by William the Conqueror, and granted to his son William Peverel. It subsequently passed through many different hands. Details of most of those entitled to be addressed as the Balliwick or High Steward of Peverel can be found in John T. Godfrey's 'History of the Parish and Priory of Lenton' (1884). To begin with the Court attached to the Honour was very important and the inhabitants of a large number of villages in both Nottinghamshire and Derbyshire came under its jurisdiction. It dealt with all felonies, other than murder or manslaughter. Gradually though the Court diminished in importance and in its later years confined itself with relatively minor matters such as actions for debt or trespass. After being housed in a variety of locations in and around Nottingham, from 1790 the Court was convened in Lenton. The chosen site was the Lenton Coffee House, which was the forerunner of the White Hart Inn on Gregory Street, Old Lenton. Originally a farmhouse constructed during the reign of William and Mary, the buildings had been converted at some unknown date into a coffee house. Supplied with gardens, bowling greens, and various other means of diversion, it became a popular resort for many in Nottingham who could stroll out and sample its delights, via a perambulation through the Park. It remained a coffee house until 1804 when George Wombwell added substantial extensions to the buildings, concentrated on selling beers and spirits and renamed the premises 'The White Hart Inn'. The Court was held each Tuesday in the White Hart. Usually the High Steward's deputy presided, assisted by a chief clerk or prothonotary. Twice a year the High Steward himself was supposed to attend at a general court called 'The Court of Trials'. All who were required to do jury service at this court had to live within the 'Honour'. 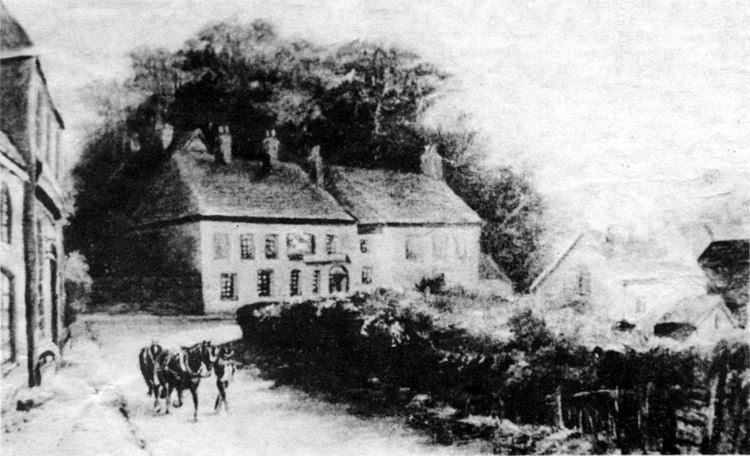 A newspaper report of Court proceedings at the White Hart in 1848 stated that three of the jurymen came from Nottingham, four from Basford, two from Nuthall, two from Sneinton and one from Radford, and indication that in this instance at least the choice was made from men living locally. If the judge deemed a custodial sentence necessary, the unfortunate person was taken to the prison cells situated alongside the Inn. It is not clear whether these were specially constructed or converted for the purpose from an outbuilding. The prison was a small two-storey building, 48 feet long and 15 feet wide; each floor was divided into three individual cells. 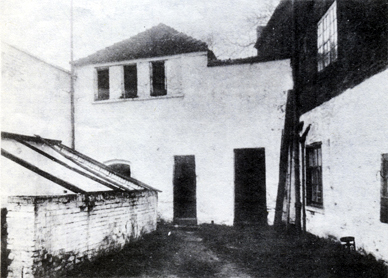 At some time after Mr. Blackner's visit, a small courtyard was created alongside the prison building and used by those confined there for recreation and exercise. As it was surrounded by a high brick wall visitors to the White Hart ought to have had little opportunity to glimpse the prisoners. We say 'ought' as it seems their confinement was not always very rigorous. The prisoners would often wait upon patrons of the Inn who sat in the gardens or played on the bowling green. Presumably the landlord felt it was such a waste to have them sitting in the prison idling their time away. It is said that the innkeeper was responsible solely for the custody of the prisoners, and food, clothing and heating had to be brought in by friends, relatives or well-wishers. It seems, however, that if the families were too poor to provide adequate maintenance the overseers of Lenton would step in and pay for it and then try to recover the money from the parish to which the prisoner belonged. 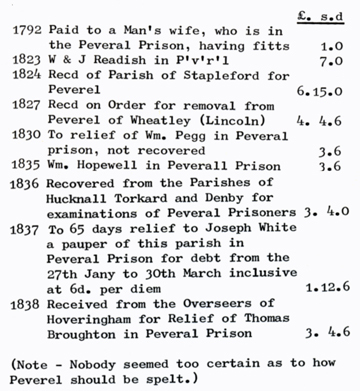 John T. Godfrey found a number of references to payment for prisoners in the accounts of the Lenton overseers (see below). The account of Court proceedings that appeared in the Nottingham Review for March 24th 1848, (referred to earlier) gives some idea of the way business was conducted. The article began as follows. 'A Court for the trial of causes was held on Tuesday last, at Mr. Godfrey's the White Hart Inn, Lenton, near this town. John Barker Esq. Barrister of Law, the Judge and Deputy Steward of the Honour of Peverel, attended by Abraham Cann Esq. prothonotary, Mr. William Johnson, the capital bailiff and a number of professional gentlemen, took his seat at ten o'clock in the morning'. A list of the jury and particulars of the thirteen cases heard were then recorded. Few of the cases involved local people and several were brought by litigants resident in Sheffield. All but one of the cases involved non-payment of debts - the odd one out being a suit for damages for "illegal restraint. The newspaper article then concluded, 'The business occupied the Court until four o'clock, when the judge, jury and professional gentlemen sat down to dinner, which was got up in the most recherché style by the landlord, and consisted of every delicacy. After the cloth was drawn Abraham Cann Esq. took the chair and Mr. Thomas Flower (foreman of the jury) the vice chair, and harmony and conviviality were kept up for some time'. With a history of some eight hundred years behind it, the Court was now in its final days, for plans were to do away with such minor courts. In 1849 the Attorney General presented a bill in the House of Commons that would 'amend the Act for more easy recovery of small debts and demands in England, and to abolish certain inferior Courts of Record'. This bill was passed and received the royal assent later that year. So the Peverel Court along with such as the Court of the Marshalsea of Household of the Kings of England and the Court of Our Lady the Queen of the Palace of the Queen at Westminster were stripped of their powers on the 31st December 1849. The final sitting of the Peverel Court took place the previous month, but no cases were heard. The Court was formally adjourned, never to sit again. Thereafter the prison buildings remained empty except for use as general storage space for the innkeeper. At some unknown time a skittle alley was erected in the prison courtyard and the whole area roofed over for the convenience of the players. More recently a staff toilet has been situated in one of the cells and in another, the large oil tank that holds the fuel for the pub's central heating system. The covered courtyard is no longer a skittle alley and is presently used for storage. Only bar staff and the occasional group of visitors interested in the Inn's history venture into this rear portion of the White Hart. But now Hardys and Hansons, the Kimberley brewery, have major plans for its conversion into a lounge bar. Conscious that the pub frequently gets very crowded and could become even more popular with the opening up of the Central Television studios nearby, they are eager to extend its facilities. the new bar would look. Courtesy of Hardys & Hanson. 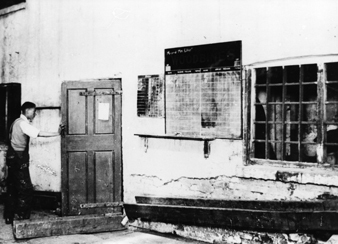 In order to create this new lounge bar, major alterations would have to be carried out to the old prison buildings. A small extension would be built out into the car park to provide an entrance lobby and toilets. 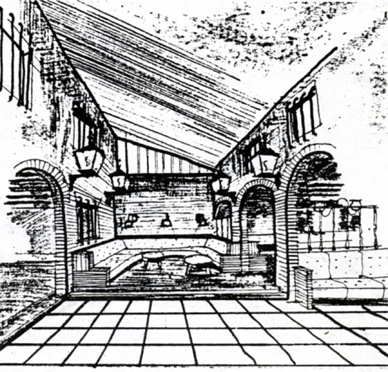 The pitched roof erected over the bowling alley would be replaced by a sloping one, and along the middle of the old exercise yard, a number of brick archways would be constructed in which seating would be provided. In a similar fashion creating archways in the existing wall would open up the adjoining area of the downstairs prison cells. The pub is to go over to a gas fired central heating system and this will permit the removal of the oil tank from one of the cells. There are relatively few features of the present building that suggest its previous use, but those that do, would be retained. Two of the open fireplaces are to be kept and the barred windows would be incorporated into the new layout. The brick flooring of the cells is still in quite good condition and the brewery architects hope that it can be used. As the flagstones in the courtyard area are badly cracked, fresh ones would be imported to replace those around the proposed serving area. There are no definite plans at present for the three cells upstairs, but there is a distinct possibility that some part of them could be used for a display area to record in words and pictures the history of the White Hart and possibly the surrounding neighbourhood. Planning permission has yet to be obtained for this conversion but also the plans must go before the licensing magistrates. There have been some legal difficulties with regard to the brewery's application for an extension of the license to cover the proposed new bar, but these may well have been resolved by the time you read this.